I've been working on developing my first iPhone game for a couple of months now but recently I've been able to commit more time to coding it, since I finished school earlier this month. In short, the game is like Galaga, but it's with doodle graphics and includes the ability to upgrade your ship throughout the levels. The idea will be that your ship is a fighter escorting a delivery freighter through the "doodle space zone". Every delivery will take longer than the last and become more treacherous. You earn money with each delivery (naturally) which you can spend to upgrade your ship's defenses/offenses. Coding a game has been something I've wanted to do since I first starting working on iOS several years ago. I started with a few Cocos tutorials (located at http://www.raywenderlich.com/tutorials ) and then decided it was time to just start creating something. 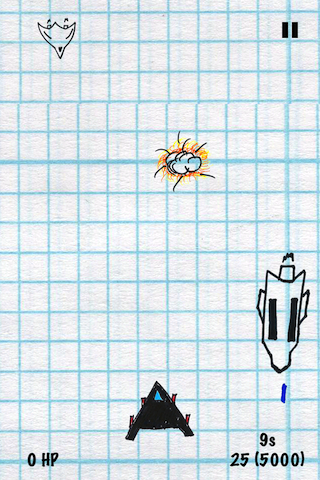 I sketched out a ton of ideas but settled on a fun space shooter game that included RPG elements. I've always enjoyed games that let me change my player in some way throughout the game, so that as I got better and got to harder levels, I could have a better character to deal with the challenge (and something to show for it). Right now, you can upgrade the ship's shield, regen time (since the shield regenerates through time), and its weapon systems. It's been so much fun coding this game and has been such a huge challenge too. I felt like I was starting to learn how to code all over again working in game development and design, vs. all the work I've done doing productivity based apps. If this game works out, I'm going to be hard pressed to not continue working on games exclusively! I'm going to be blogging about some of the technical things I've learned as well as the general lessons learned from learning how to code games using Cocos2d.